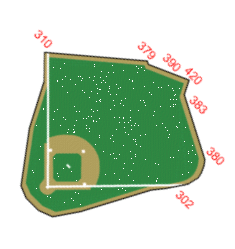 batted ball locations, we can at least start looking at these things. exceedingly complicated, and some might consider it a fool’s errand. 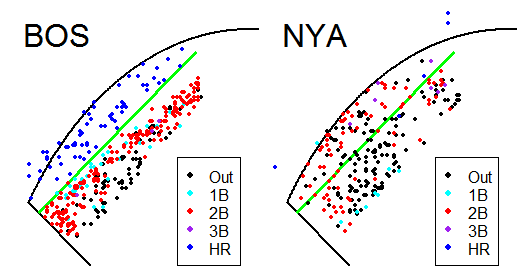 fences is just one way a park might affect a particular hitter. bright lights of the City that Never Sleeps. chip shot in October 1978.
the field of play in most left fields is beyond the wall in Fenway. makes it harder to hit the ball over it. look at hit charts of balls hit in the Wall’s vicinity. of each point shows where the ball was fielded. on the chart, hence they aren’t included. up on the wall somewhere and were fielded when they came back down. just use the generic outlines for illustrative purposes. differ substantially. 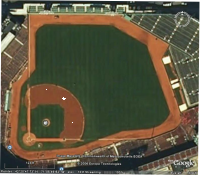 The Google Earth photo shows that the Green Monster runs essentially parallel to the right-field line, as I mentioned above. the position of the outfield walls. either home runs or doubles (or singles) in Fenway Park. up rolling to the wall. Doug Mirabelli. Of those 27 balls, 17 actually hit the wall, or 63%. switching-hitting Mueller was batting left-handed). wall-balls only one went for a double. Good hustle, dude! Oh, well, that’s just Manny being … lazy. road that year, to the tune of about 250 points of OPS. Lefty or Righty? Conventional Wisdom is Right! those fly balls over the Monster? Somebody like J.D. Drew, maybe? 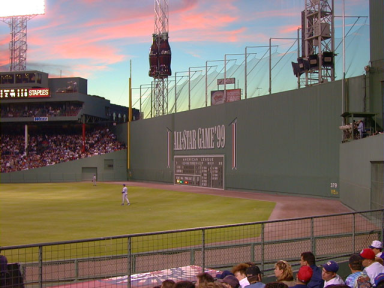 over the Green Monster in 2005.
sample and these results may not hold up when we analyze more data. least as regards the Green Monster. Stay tuned. The hit location data that I used here was obtained at mlb.com.